“5Q” is an online-only column featuring five questions about stage productions in the Metro Area. Periodically, “5Q” will take the form of an interview with actors, directors, writers, etc. to shed some light on the production process. Johnny Depp and Kate Winslet astounded audiences in the 2004 film Finding Neverland. Now the Broadway hit of the same name (and winner of Broadway.com’s Audience Choice Award for Best Musical) is set to take the stage at Minneapolis’ Orpheum Theatre. Playwright J.M. Barrie experiences a bit of writer’s block until he meets four young brothers and their beautiful widowed mother. Hit with a spark of inspiration by the boys’ enchanting make-believe adventures, he sets out to write a play that will astound London theatergoers. Peter Pan is born and Barrie takes a giant leap into Neverland where nothing is impossible and the wonder of childhood lasts forever. 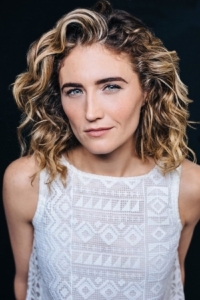 Minnesota native Kristine Reese takes on the role of Barrie’s wife, Mary. Audiences may know Reese from her appearances in the touring casts of the Broadway productions of Wicked (twice) and Pippin that have played the same historic theater. Peter Pan is a character and a story that has been reimagined in theater, Hollywood, and literature numerous times. What about Finding Neverland makes the allure of “the boy who wouldn’t grow up” fresh and new, particularly to young and old alike? 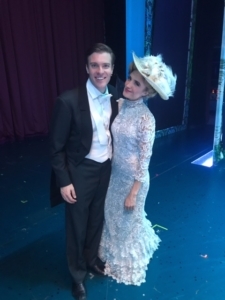 Kristine Reese: While Finding Neverland certainly tells the story of how J.M. Barrie came to write his play Peter Pan, our musical is really more about the inspiration for the story itself, which is the child inside of ALL of us. It’s about what the character of Peter Pan embodies, which is presented through Barrie: child-like wonder, youth, vitality, imagination, creativity, and the infectious spirit children possess that all adults wish they could have for themselves. In our story, Peter Pan is J.M. Barrie, but really, the message is that Peter Pan is ALL of us. Neverland is a place Barrie created so that he could see the things and the people he wanted to see. For us, Neverland is a place of our own that we can make whatever we want it to be. I think every single person, young and old, can relate to that and it brings up a lot of emotions. Having been based on a movie, what can audiences expect from Finding Neverland as a theatrical piece? KR: It’s obviously the same story, but we tell a lot of the story through song and through movement, both of which are very contemporary presentations and juxtapose with the time period of the piece. I think this is an interesting choice. The theatricality of the movement, the characters, and the effects are important because it does help you see how Peter Pan was literally plucked from J.M. Barrie’s life. There are a number of technical elements which give some of the imaginative aspects of the story a real three-dimensionality that you often cannot portray in film. It really feels magical because you see it with your own eyes LIVE and you almost cannot believe it. How do you prepare for the role of Mary Barrie, a real person in a very fictionalized account of a period in her life? KR: Unfortunately the real Mary Barrie was not such a great person, but as an actress, you cannot play that. As an actress, I must live HER truth, however unappealing or immoral that may be. Mary is representative of a number of things in the life of J.M. Barrie and the impetus for some of the themes of Peter Pan, and if I tried to make her more appealing, I would not be serving that purpose. One of my lines is, literally, “When are you going to grow up?” I love that I get to say that, and, if I have done my job correctly, the reaction that it subsequently gets. Another very important part of my portrayal of Mary is the commentary on the culture in London at the turn of the century she provides. Mary is very invested in climbing the social ladder, holding fancy parties and seeming sophisticated, though she herself did not come from money and only got where she was because of her husband. I certainly do not subscribe to that way of living, but I think we all know a few people who might, and that is where I try to draw my motivations from. She wants what she wants and she will do what she has to do to get it. Also, I get to be onstage with my real-life husband (who plays J.M. Barrie) and we have a fight every night on stage and that is kind of fun. Having grown up in the Twin Cities area, you’re very familiar the city. What’s it like to be returning home as part of the touring cast? What’s on your list to do while you’re in town? KR: It’s always nice to be back. I live in NYC now, and it’s obviously different, but Minnesota is part of who I am and will always be a part of who I am. I have a lot of pride in this town, the people and their spirit, the progressive values, and the real commitment to the arts and eduction. When I say I am from this area people just ask me about farms and the cold because they just have no idea what it’s like and haven’t really bothered to find out, but I am so proud and excited to show the cast what it’s really like in the Twin Cities. Everyone always ends up so surprised and very impressed. As for a list of to-dos, I always like to check out the new neighborhoods and restaurants, maybe see a football or a baseball game (really want to check out the new stadium! ), and of course, see my brother and my niece and nephew. It’s really hard to see family when you are traveling all over the world, and family is everything. You’ve been on multiple tours before with other shows, even stopping in Minneapolis a few times. What draws you to these national tours and away from home? KR: This is my sixth tour, so I am a tour veteran! I’ve seen just about every major city in this country and gained a lot of perspective and life experience from being on the road. I love talking to my dressers, the local crew, the barista at the coffee shop, or the fellow dog-owner at the park about their city and what’s great and I try to take time to check out as much as possible. Our schedule is very busy, so it can be difficult, but on this tour, I’ve made a point to stay in Airbnbs or rental properties instead of hotels and check out the new neighborhoods. I also have a denim jacket filled with pins from all of the cities on this tour and it’s already full!! But no one else I know can say they’ve got that. If I am being honest, I would really LIKE to be home with my husband and my dog, but fortunately, we get the unique opportunity right now to all be together on the road. So we’ve made our suitcases and each other home! 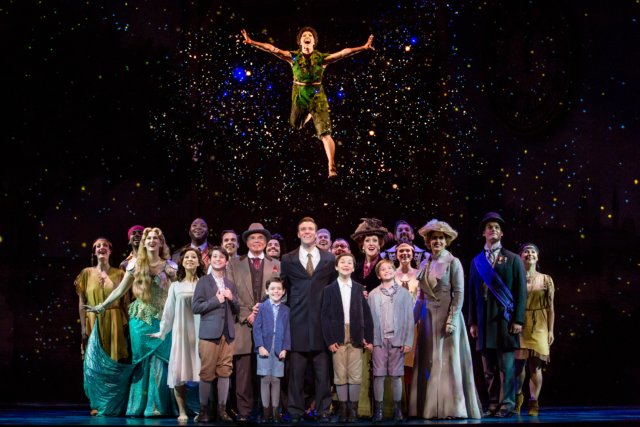 Finding Neverland runs at the Orpheum Theatre October 31–November 5. For more information and to purchase tickets, head to www.hennepintheatretrust.org.